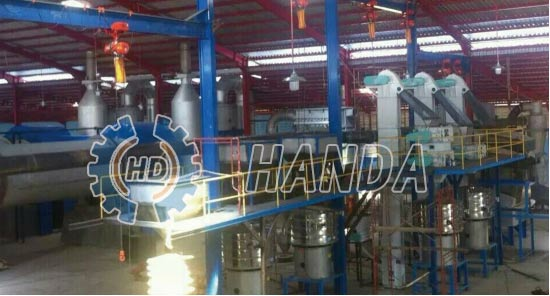 The HDAC series activated carbon production line, which designed by Handa Machinery equipment Co., Ltd, consist of crushing system, carbonization system, activation system, final products crushing and screening system, and packaging system. 1. content, temperature, air supply and capacity. The proper speed of the drum is helpful to meet the demands of next procedure. The automatic control of the temperature monitoring system makes the operation easier. The heat energy that drying system and steam boiler need could use the waste heat which comes from carbonization and activation system. It can not only make full use of the waste heat, but also save the energy. 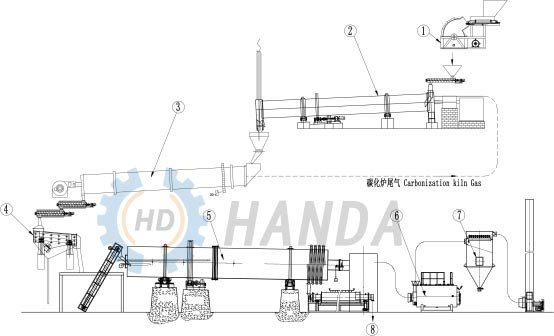 This production line could be used for producing various activated carbon. 1.The rotary dryer, carbonization kiln and activation kiln adopts rotary structure. The speed of the dryer, carbonization kiln and activation kiln could be adjusted according to the water content, temperature, air supply and capacity. The proper speed of the drum is helpful to meet the demands of next procedure. 2.The automatic control of the temperature monitoring system makes the operation easier. 3.The heat energy that drying system and steam boiler need could use the waste heat which comes from carbonization and activation system. It can not only make full use of the waste heat, but also save the energy. 4.This production line could be used for producing various activated carbon. Material：Wood Chip, Coconut Shell, PKS, almond shell and other kind of shell. 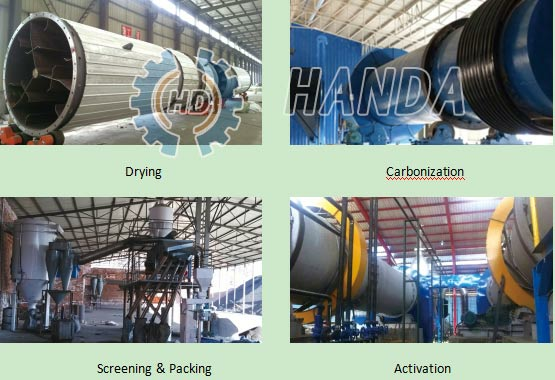 Shell and other high-quality raw materials through the company's advanced technology and supporting process made of activated carbon have the advantages of developed porosity, high adsorption capacity, decolorization and deodorization fast, high tensile strength, long service life. By adjusting the parameters of the equipment can be used in different production of activated carbon. The products cover the adsorption of gold with coconut shell activated carbon, water purification, monosodium glutamate, refined charcoal, petrochemical sweetening special carbon, vinylon catalyst carbon, ethylene removal saline carbon, filter tip coconut shell activated carbon, and widely used in food, medical, mining, metallurgy, petrochemical, steel, fine chemical industry.